I picked up a couple of EnergyBras today, Pinkalicious and Very Green. Here is the Pinkalicious Energy Bra over Raspberry Glow CRB. Raspberry is brighter while Pinkalicious looks a touch washed out next to it. I do like Pinkalicious though, it’s like a brighter coral pink, or much more vivid and intense Bleached Coral. If there is a solid Pinkalicious CRB I think I’d rather get that and sell my NWT Raspberry Glow CRB. I don’t need both. Too bad we aren’t seeing as many shades of green as we’ve seen shades of pink and orange. 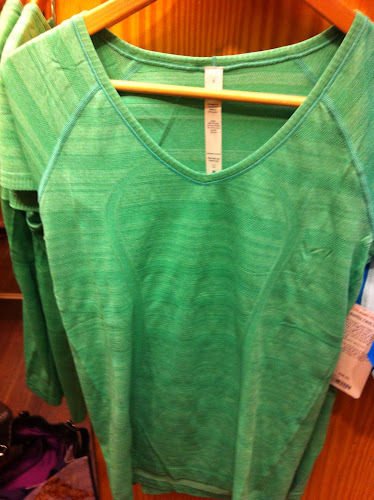 The blue Swiftly V-Neck was solid while both the pink and green had this woven line pattern which I really like. The different weave made it much stretchier and soft, especially compared to last years v neck Swiftlies. I opted to go with size 10 on this one even though I’ve moved to size 8 CRB’s and Bras. I just don’t like such a thin material clinging to my mid section. I’ll have more pictures tonight of a couple of new tanks. The Run: Mile A Minute Tank and, Open Soul Tank. "New! Run: Mile A Minute Tank and Run: Pace Tight in Pinkalicious/Parfait Pink"